I'm really like this skin. Could I use this skin with RPi B+?. Of course, the skin can be found on Github(https://github.com/bboyandru/skin.CarPC-touch_carbon). When I use the shutdown button on the KODI interface and tell the system to power off, the KODI GUI goes away but I am still left with the navigation screen. Is there any way I can get the system to power completely down and not to revert to this? I am trying to SSH into the RPi from my linux desktop and it is asking for a password. I did change it to a when first starting the process as instructed but that is not working. Any reason why that might be? The last thing is, command line, how would I access that from KODI? Hello, thanks for the amazing job! Just a suggestion - would it be possible to create a plugin for video recording including preview? That would be very nice feature having in mind that Raspberry PI camera is amazing product with exellent software support. I currently use it and it is recording in background but I would like to see video preview integrated in KODI. Thanks for sharing such a nice information. You can also visit Precision Drawell website for Fine Wire Manufactures In India. Hey how can i update Kodi? I need USB Soundcard function. Necesito que me ayudes!! no puedo instalarlo! - Did you manage to get the car's FM antenna connected to the FM module or you have a separate antenna? What about the ohm rating mismatch people on pi forums talk about, do you have good reception? - What about bluetooth handsfree? I'm looking on implementing bluetooth handsfree, pair my smartphone and answer\receive calls using the car's sound system. I still have to read and test HFP for Linux and other stuff. Hi is it possible to just use this as a loader skin for a Android tablet. The reason I ask is because I'm using kodi for android on my tab and now using your skin. Luv it! Can I substitute the navigation for an nav app of my choosing? ie: iGO, Sygic etc. 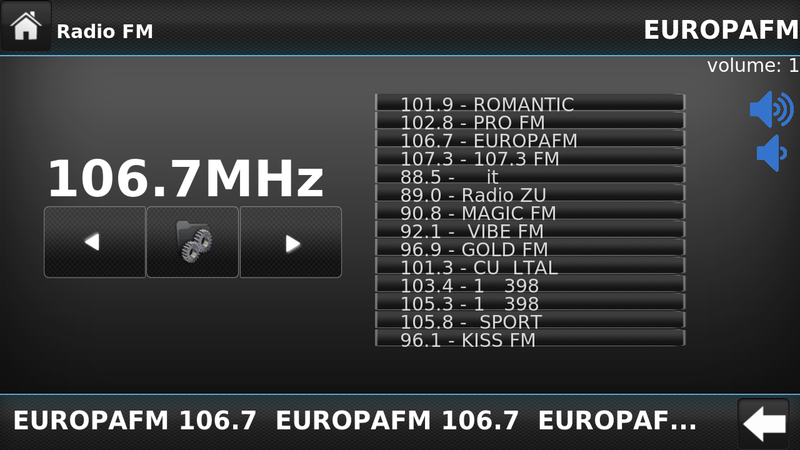 Also can I substitute the FM Radio button for a streaming radio app of my choosing too? ie: Pandora, Spotify etc. And IMHO the power and programs buttons should be moved down at the bottom left of screen border, to free up the navigation and programs button for something else. 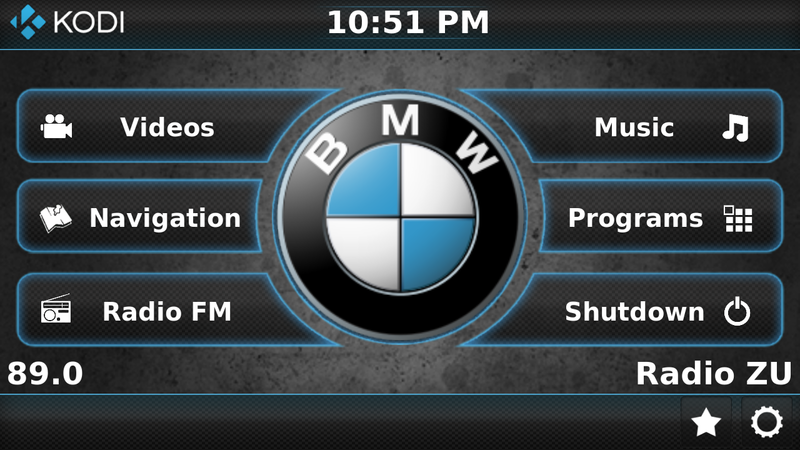 All in all, this is a excellent skin for kodi when using in a vehicle. I just wish that this can be used on a tablet without having to use a Raspberry Pi2. Thanks for this wonderful skin. Hi! I have RP2 and my system is extremely slow... Can you help? it does not work... i tried it several times.... could you please check, of u can install it like your tut is? Go to forum and you guys find some help !! For sure . That's really cool idea i like this . for more about this you can visit this link feel free . we have lots of great of stereo system thanks . 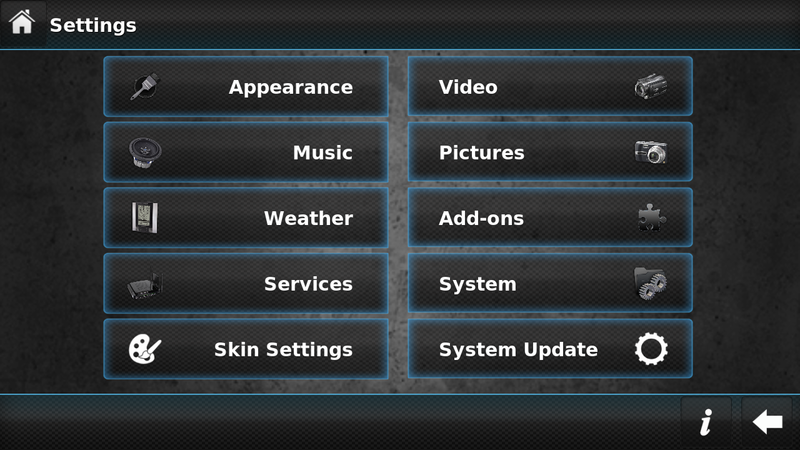 This is really a great share about "custom console skin",..i like it,. Hey, would you be available to chat, via irc or some other method? 1. Large HDMI screen at the rear for the viewers at the Back(the front screen will not display the video image during video playback. 3. An external shut down mechanism for the RPi2, the Audio Amps, GPS adapter and ext hard disk.Will be building switch mode adapters for the system, one for the PI and one for the Display. 5. An external USB and Aux input on the front panel. I have several questions I would be asking as the build progresses and I hope I can ask them here. If not please tell me where I may do so. Since I like your blog and the way things are presented I would like to contribute if possible. Will it work with RDA5807M fm module? If someone make it work please tell me how. really great work. will try this. but one question. is it possible to change the programms with a connected rear-cam? is the menue flexible or are only video, navigateion, radio, music, programms, shutdown possible? Hi, That CarMediaCenter will work on Orange Pi2? Will this work with satellite (XM)radio (USA) as well? and will this eliminate the use of a separate GPS? I have the same issues where my screen goes white and other similar things you are describing. Did you ever manage to fix this issue? have you been able to figure this out? I have the same problem with kodi.bin not being found, carpc-controller and navit also say no process found. Someone solved the problem ? please are you sure this work with satellite (XM)radio (USA) as well? and will this eliminate the use of a separate GPS? Hi, What LCD TFT screens do you recommend for using with this project? Have you done anything with integrating OBD tools into this head unit and/or using a Bluetooth receiver to tether your phone? Could this be used as a port in RetroPie? RetroPie currently supports a Kodi install from it's experimental software list. That version of Kodi is then bootable from the ports menu. I get the same error did you ever solve? under "Programs", what goes there? Not working ....i tried 4 versions of wheezy..its only loads the navit after the video loads the navit only,not the kodi..
Is this working for RPI 3? Anyone? Not for me - Can't get Weezy to work on Pi 3, and seems that there are issues in Jessie that make this in (very hopefule!) need of an upgrade to work in Jessie on Pi 3. It will not load... suggestions? Thanks and GREAT JOB on this!!! It would always stall at the 4 gig mark for me, until I used Firefox to download. You can go into your settings and switch the language from German to English,I thinkunder the Appearance section under Setup. I still can't get it to see my wireless or camera. But I'm WAY new at this so that doesn't mean much. If any of you guys can figure more of this out give us a heads up! looking like advance technology in car purpose's wow interesting blog. Well your services are just perfect in every ways. Thanks for delivering the dump timely and top of that I passed my exam with 94% marks. :) thank u very much pass4sure 300-075 CIPTV2. I shall keep visiting your site. Noob question I am having trouble trying to transfer the files over to the sd card. Can anyone help me out? Is there some plan to make installer for raspberry 3.
thanks for this post, but im trying to find double din head unit for my BMW right now. Hi All! Great post! Quick question I am planning to build this set but not sure which RPI to buy 2 or 3. The 3 is prefferable for me but seems like it's not working as expected. Can anyone Confirm whether PI 3 is causing issues? Thanks in advance. Can anyone Confirm whether PI 3 is causing issues? Hello everybody and sorry for my English but I am an Italian boy. I would like to make a car pc 28th raspberry pi 3 model B.
I have just bought all the components. The first is that I don't know how to install the operating system and what to install. The second is that I don't know where I can download the operating system. Any way to get this to work on a Raspi 3? I too would like to know about this. Mainly, will this DIY work on a raspberry pi 3? Is this project supported anymore ?! It's amazing what we can do and introduce with this. Thanks For sharing this wonderful article !!! hi did this work on a raspberry pi 3? thanks admin for sharing up such a cool and useful post. keep up your great work. thanks admin for sharing such an informative post. Great blog, Thanks For Sharing very useful information. We Can Fit offer mobile car audio installation and fit all aspects of in car entertainment equipment, sat navs and parking sensors - nationwide mobile service. Nice article man! very good infos on this site! very good job on this. I am checking this page, when I have time, and dream about my own computer in car. But I cannot chage it easily. I have Citroen C5 2005, and there is audio connected with pc and climate control. And as I see here, there is no possibility to control climate through this computer, isnt it? You site is perfect!!!! very very good !!! Can I make your project with a Rasp PI 3 ?